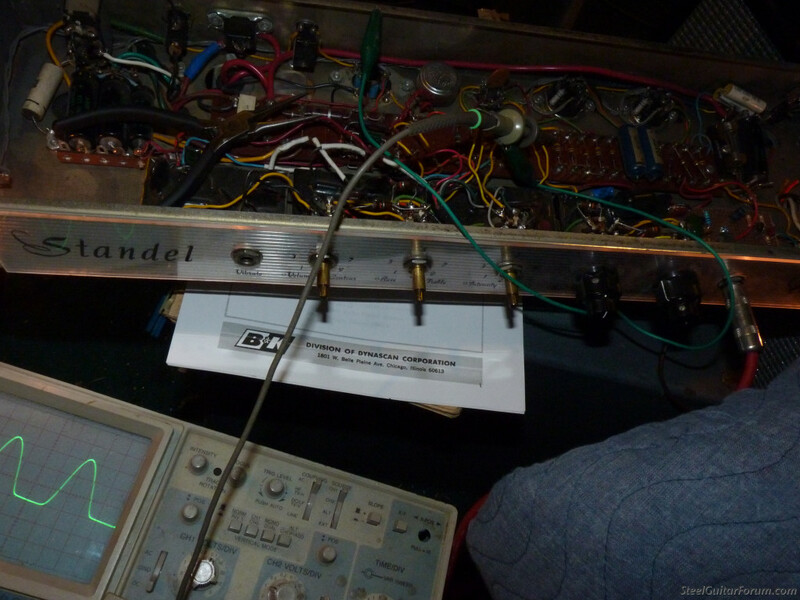 So I am doing a simultaneous repair of two Standel Custom 15 chassis. This will document what is involved in repairing these amps. 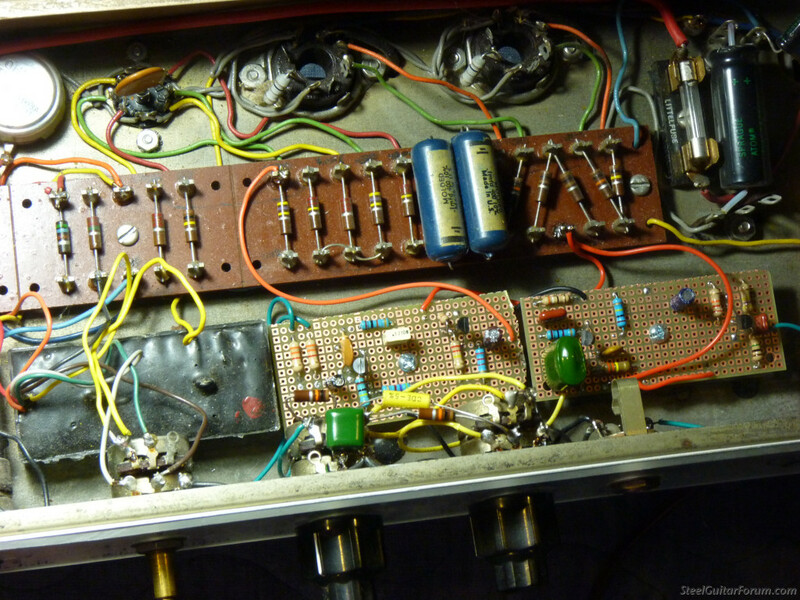 The first chassis is one of the earliest versions, with the potted modules made using germanium transistors. These modules were made by wiring the parts and wires to multiple terminal strips, which are then put inside the clear plastic tray and potted in epoxy. They used 6GW6 power tubes, with the plate cap on the top of the tube. During this process I am going to evaluate how they work with regular 6L6 power tubes, with any mods that might be required. I was able to verify that both Normal and Tremolo input modules are bad. Because most of the wiring has been pulled off, I don't know the status of the EQ/Tremolo drive, Tremolo oscillator, or summing modules. First thing will be to get the Normal input module working, then verify the summing module. 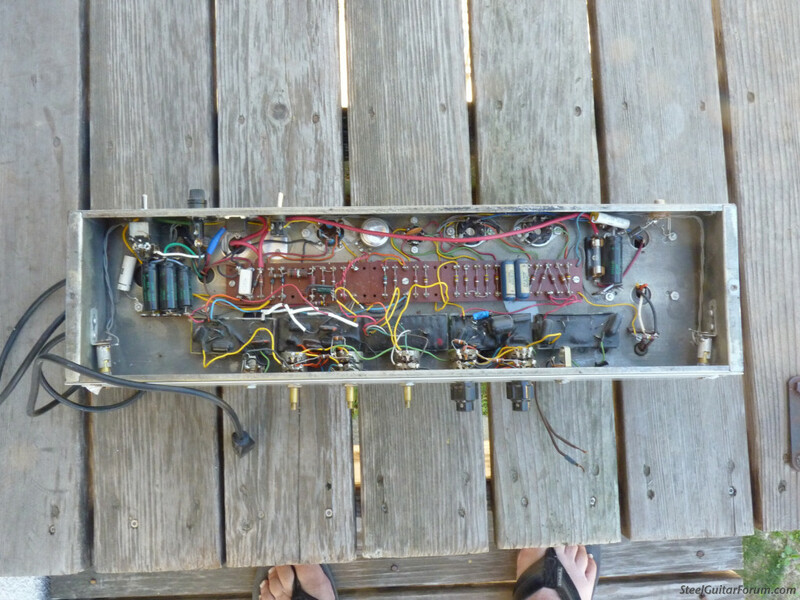 The second chassis is the 2nd generation, with most of the power supply and amp circuit parts mounted on a long terminal board. These have the same complement of potted modules but these are using silicon transistors and printed circuit boards that are potted in the same clear plastic trays. The circuits are very similar to the previous ones in schematic design. Still using the 6GW6 power tubes. The third version of this chassis is identical but 6GT5 power tubes are used instead. This one has also been verified to have bad input modules and summing module. As with the other chassis, this will get a new Normal input module, then verification of the summing module. Built an input module for the Normal channel. Mounted and wired into the chassis. Fired it up and it is working fine. Testing of the Summing module shows no gain and the passed signal up at the supply voltage, so this module is definitely bad and needs to be replaced. Wow! It must be nice to be able to do this! Jerry, that's your original chassis marked as Chassis #1. Built a new input module for Normal channel. All wired up and it is working fine. Tested the summing module and it has signal of the approximately correct gain but it is clipped on the negative side of the signal. Looking at the module, a previous "tech" cut into the epoxy and installed an electrolytic capacitor. I doubt if it is the correct value but will use it for now to further troubleshoot this chassis. Will replace the module at a later time. A labor of love. Cool and interesting work. Thanks for posting. Most of today was spent demolishing a hybrid yellow module to slowly reverse engineer the circuit as I grind away the epoxy with a dremel tool. Some of the transistor connection were hard to trace because of the wires disintegrating from the dremel. I might still have to destroy the second non-working one to verify those connections. Had a Tweed Deluxe, Princeton Reverb, modified Bassman, Pro Reverb, and GK 800RB with problem SWR speaker cabinet in for repairs, which took up most of my time for the last week or two. Now back to the Standels! Built the summing amp boards for both chassis. Got the wires installed and cut to length for Chassis#1, but then I noticed that the power amp section was a mess from the previous technician. Noticed parts that are just tacked into place or leads left way too long. On closer inspection I found parts and wires not attached at both ends for the power amp and the power supply. Started working on cleaning all of that up and verifying circuits. Chassis #1: The power amp section has been cleaned up. The phase inverter circuit is unique with this amp in that it uses a "cascode" style that I haven't seen in any other amp. The screen resistors had been removed from the power tubes and the power supply section driving them was dismantled. Other parts were added and other parts and wires removed. It was a mess. It looks so much better after the cleanup. The power supply section for the screen grids has been rebuilt, with the voltage going to the correct locations. The changes to the voltage doubler power supply circuit for the tubes is also repaired, with correct parts installed and extra parts removed. Unfortunately, the plate caps had been removed from the amp by the same tech that did all this other work. New plate caps are on order and shipped today. Now to hooking up the summing amp module. Chassis #1: The summing module is installed. 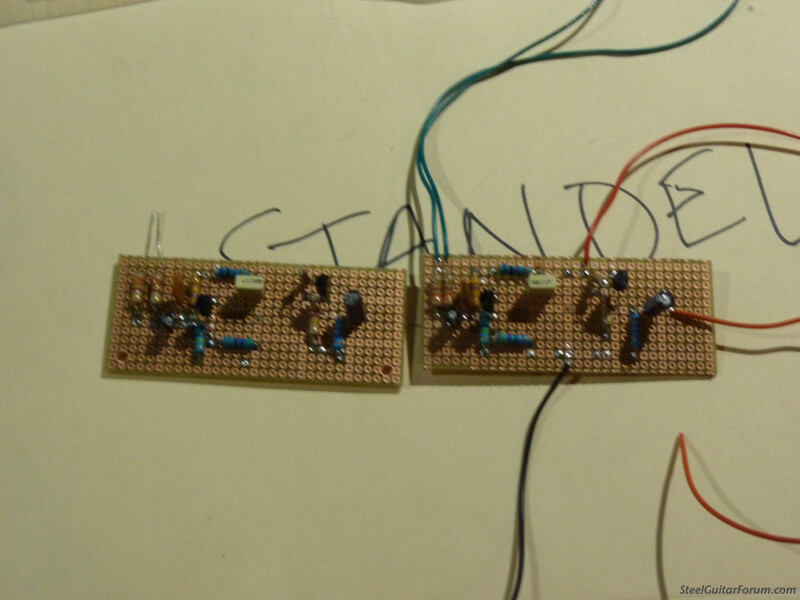 Signal is now there through the summing amp and out of both the "+" and "-" legs of the tube inverter circuit, which feeds the power tubes. Once the plate caps show up, there should be a fully functioning "Normal" channel all the way to the speaker. 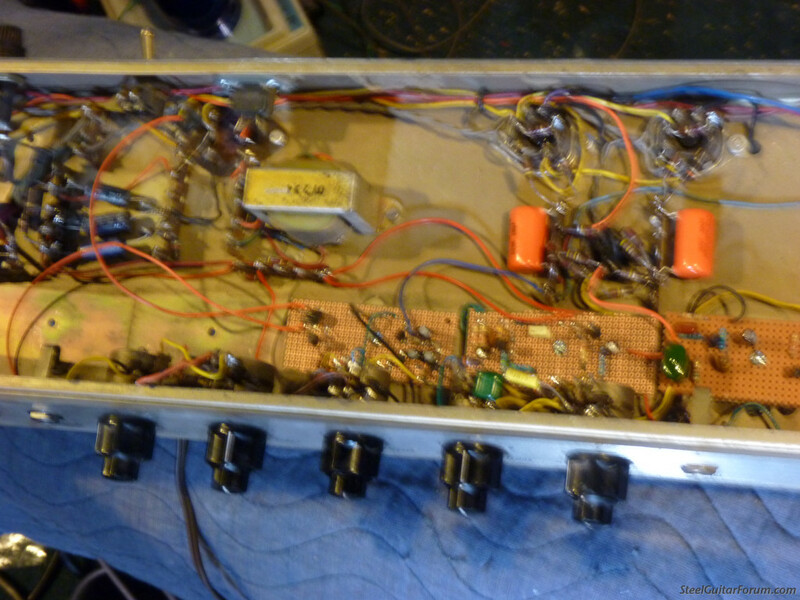 Next is the "Tremolo" channel of Chassis #1 and summing amp of Chassis #2. Chassis #2: The power supply had been compromised and a huge box installed for 2 electrolytic caps. The voltage doubler power supply is now wired correctly, with two mounted capacitors instead of the ugly big box. The summing amp module has been installed and is ready for test. Wonder what years Standels were built ? Mine is 63 or 64 chassis #1 Michael is rebuilding. 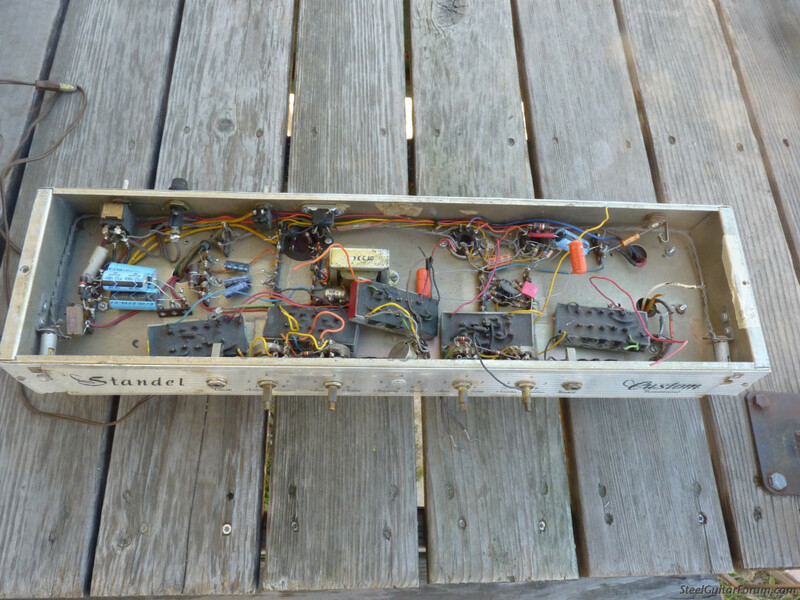 The first Standel amp was build in 1952. They were all tube design until 1962 or 1963, when they started building hybrid amps, with a solid state preamp and tube power amplifier. These amps were in a constant state of flux, with the module designs changing from one build to the next and changes in power amp tubes. Then in approximately 1966 the amps went fully solid state. Chassis #2: More corrections to the power section for the modules. Also had intermittent module voltage which was isolated to a solder blob that was hanging down underneath the terminal board and shorting to the chassis. That was fun to track down. 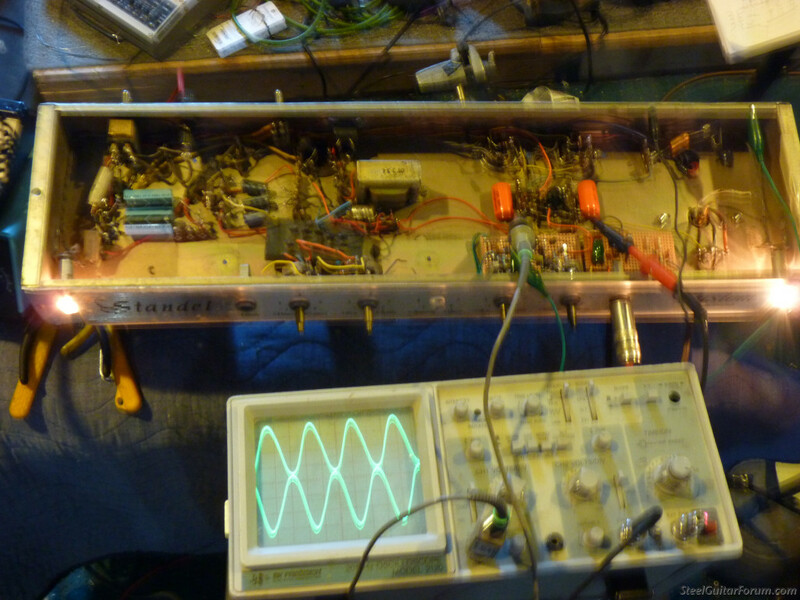 Fired it up and the signal is coming through the summing board and out of the phase inverter to the power tubes. 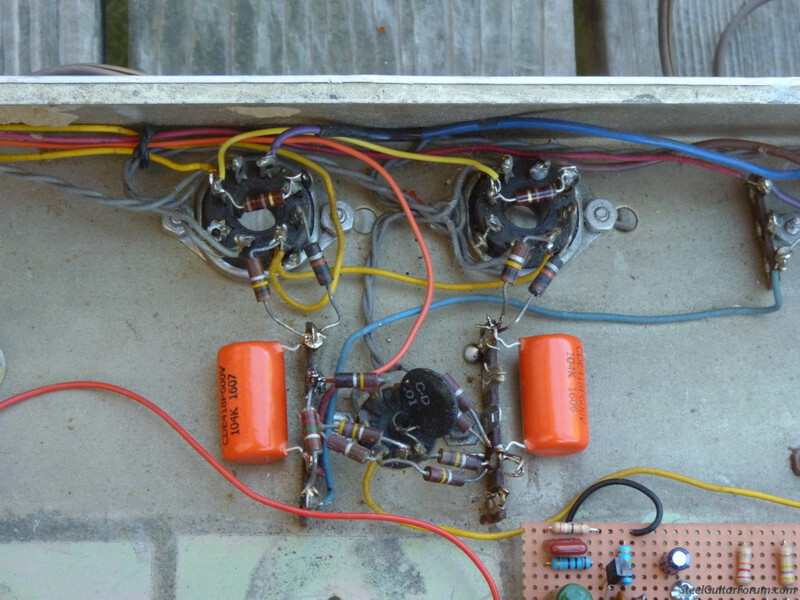 The Tremolo circuit is kind of touchy because of how it uses a transformer and output summing inside the preamp module. Since the yellow, orange and red modules were all bad, I decided to redesign the circuit a bit by using an optocoupler and doing away with the transformer and extra orange module. This makes it closer to the full solid state modules but still a bit different. It should be more robust than the original setup, which seemed to die continually (I sent mine to Standel in '69 who replaced the red module only to have it die again 6 months later. Tested the module everything seems to be working as expected. -- is the workmanship in photo #1 in the first post that of the prior repairman or is this the build quality of Standel? -- is the epoxy thing a cloaking, secrecy thing or is it to stabilize and immobilize parts, like waxing a pickup? ...is the epoxy thing a cloaking, secrecy thing or is it to stabilize and immobilize parts, like waxing a pickup? I remember reading (I believe in the Richard Smith book) that Leo used to come around to people's gigs with a flashlight, climbing on stage and peeking into the back of their amplifiers. Mr. Crooks apparently took exception to that practice, and began encasing his circuits in epoxy to prevent his proprietary designs from appearing in the latest Fenders. 1. 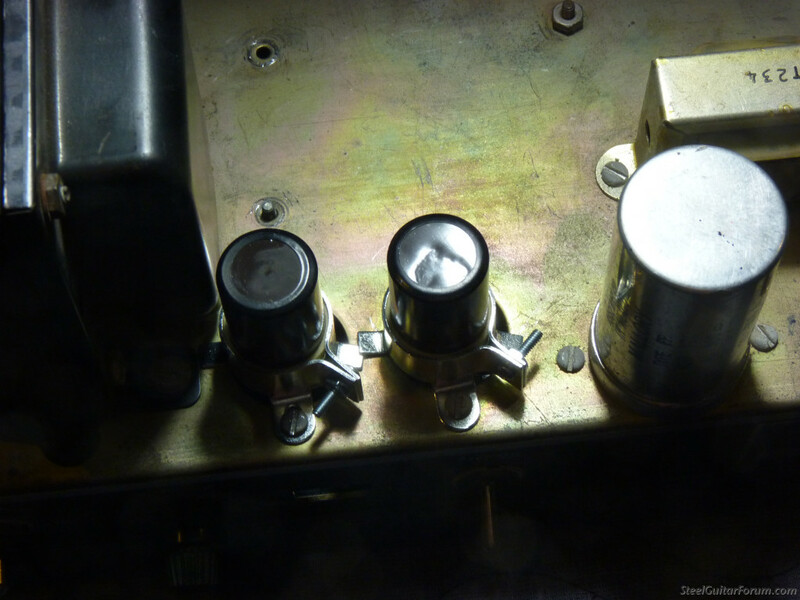 The workmanship in the first and any "before repair" photos is from the repairmen that had previously worked on the amps. I found the majority of it to be totally substandard. 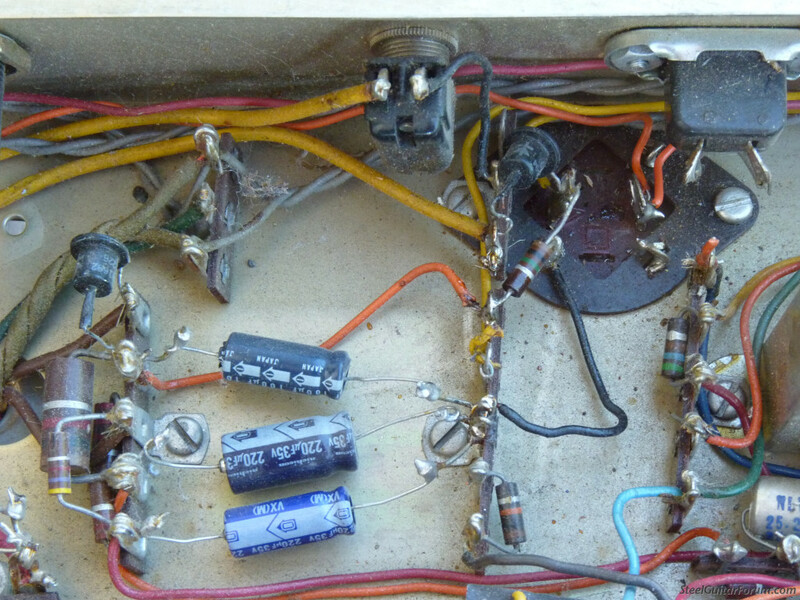 What you see in the "after repair" photos is more how the amps came from the factory. 2. The epoxy thing was mainly to hide his designs. He was also under the wrong assumption that the transistor circuits would not need repair. 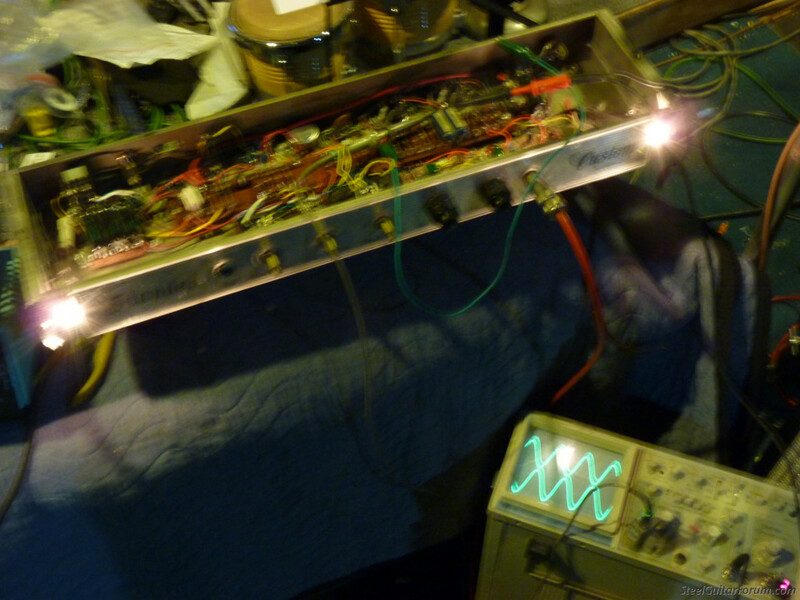 As an example, my Standel Imperial head manufactured in 1964 blew out two Tremolo oscillator modules by 1969, with the second one going after only 6 months. No one was building transistor amps at that time, so Crook was ahead of his time and probably thought that they would become more popular than they did, hence the secrecy. And thanks Jack--that is such a funny mental picture, Leo lurking with a flashlight. Chassis #1: The tremolo module is install and wired except for the wires for the optocoupler. Those will get attached when the other preamp is made and installed. 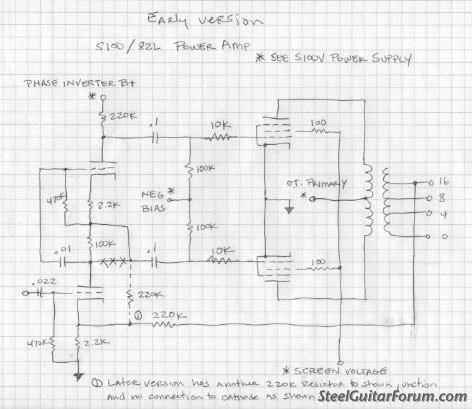 There was a change to the power supply circuit for the tremolo module to make it per the power supply schematic, which is the same schematic that is available online for the S100V. The plate caps came in so they have been wired in as well. The wires can be seen going through the holes next to the sockets in the picture above. Here they are hooked up to the tubes in the picture below. 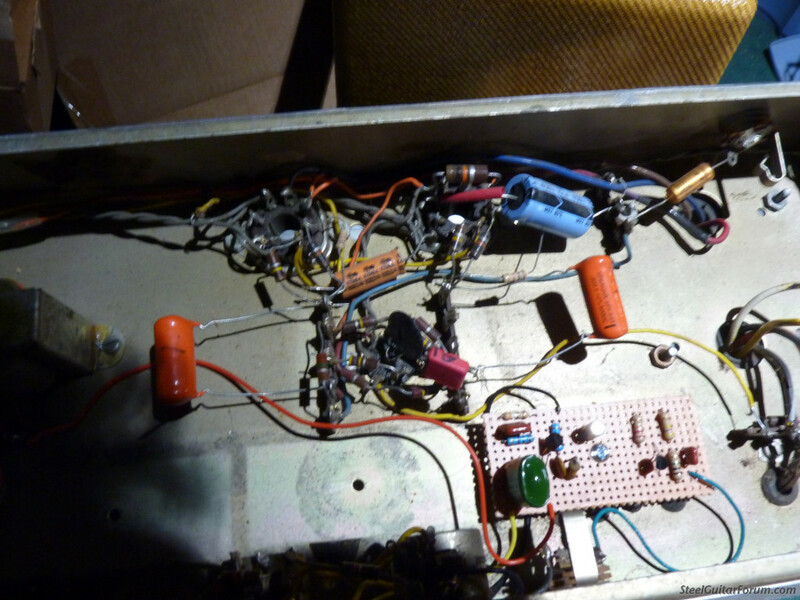 Chassis #1: Well, I got bit again by some previous tech who had replaced the output transformer and wired it wrong! Right after I turned it on, it started squealing and beating. One of the power tubes started glowing then smoking before I could turn it off. Examining it compared to the other chassis and an S100V that I have, the tech wired the output out of phase. 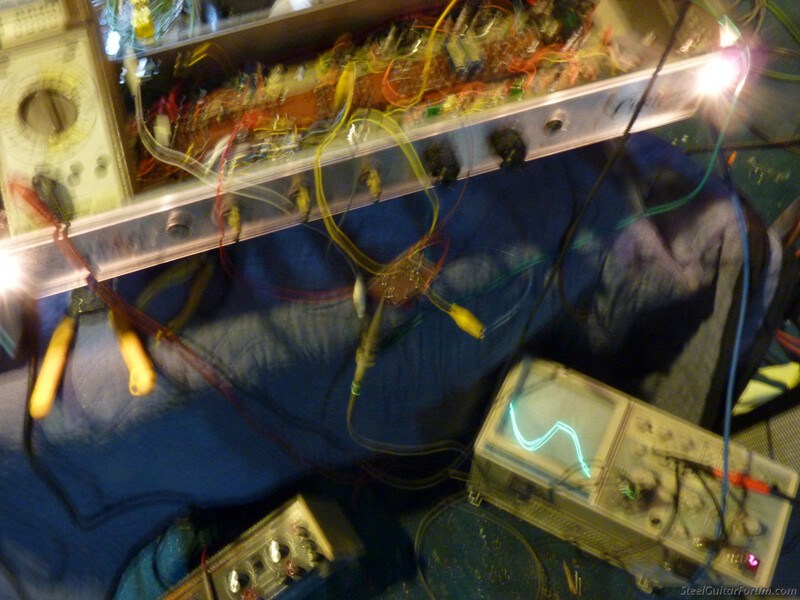 The feedback loop was the wrong phase which set the power amp into runaway high gain and oscillation. 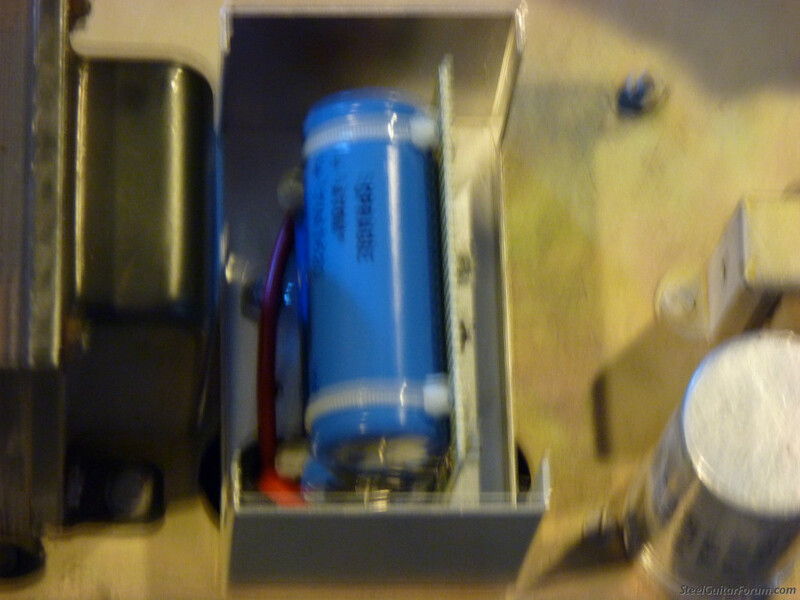 The later version chassis's have a fuse in place for the high voltage going to the output transformer. This earlier version does not so I was worried that the transformer primary might have fried. Luckily it still looks good on a meter. The output checks out okay as well. Dodged a big bullet with that one. Didn't want to have to buy a new OT to get this going. I received two chassis and enough modules for close to 3 amps. I am assuming that this output transformer came from either a similar amp or from some other amp that was in the ballpark. Since the output wires don't match colorwise, I will need to run a signal through the transformer and figure out which outputs are which. Chassis #1 update: I found there were two problems. 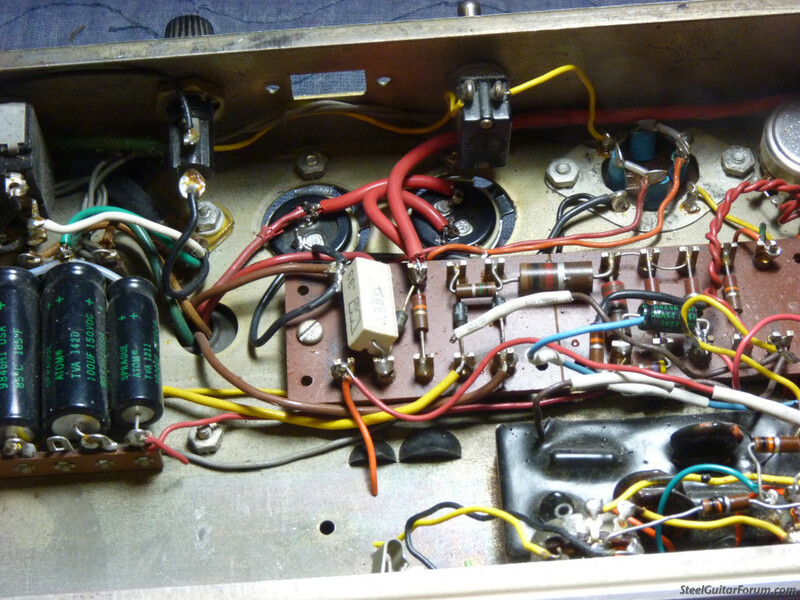 First, there was a ground wire that was cut previously by the previous tech so when I hooked up the tremolo oscillator with no ground it sent signal throughout the power amp and was the main culprit to the overload. Second, yes the feedback loop was the wrong phase so that when it was engaged int actually boosted the signal. Installed the missing ground. Pulled the feedback loop, which previously had been dangling, and left it dangling for now. Put known used tubes in and powered it up. The amp is now passing signal. Plugged in a guitar and the amp has way too much gain. 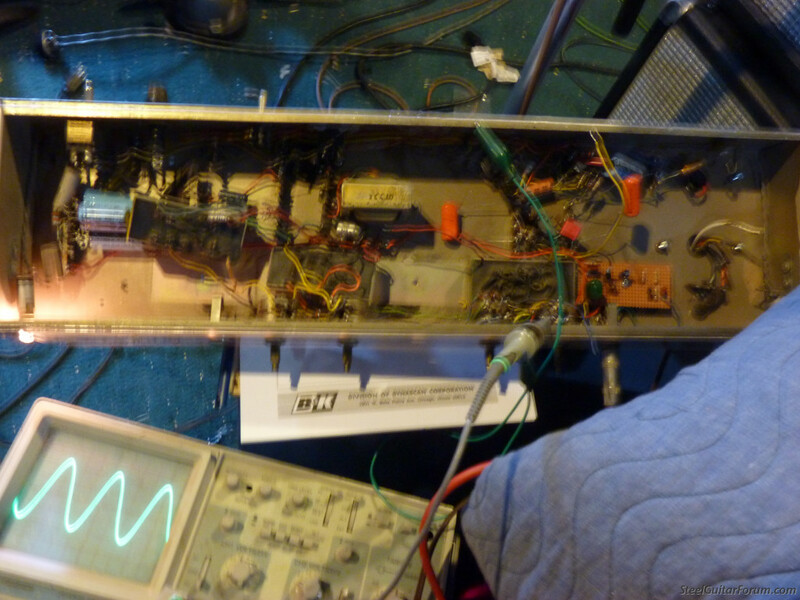 The feedback loop will not pull it down that much so that means the phase inverter tube, a 12AX7, will need to be replaced with a much lower gain tube, probably a 12AT7 or maybe even 12AU7. But that's minor. Will get the speaker impedance and phase sorted out later. Now to get that preamp in for the Tremolo channel. Chassis #1: Second input module made and ready to install in amp. Installed three prong power cord. Removed the two-prong panel mount power connector and cutting the opening to accept a regular 3 prong connector. 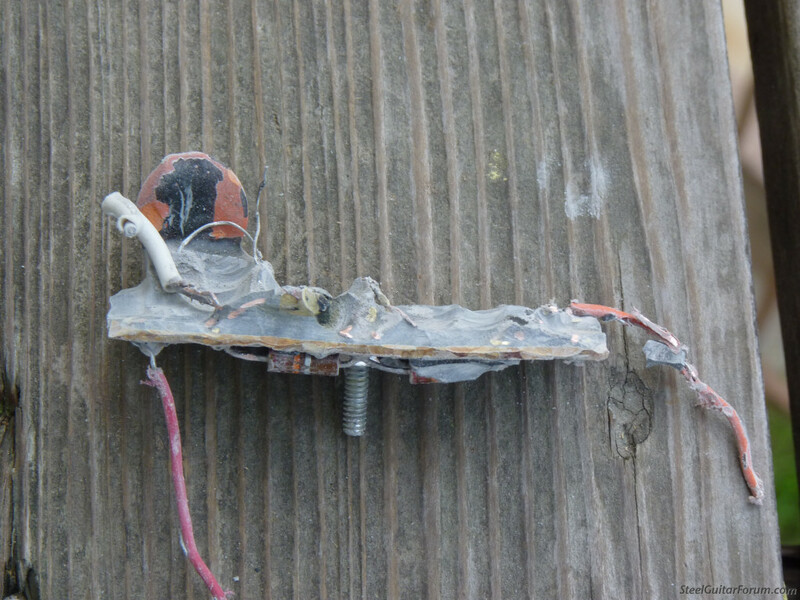 Found transformer speaker wires were not even soldered to the terminal strip. Measured and know which wires to use for the 16 ohm speaker. Chassis #2: The tremolo module has been installed. Ready to test through the power amp. Since anyone, with time and attention to detail, can draw out the power amp section of the Standel S100/82L/83L amps I am including the drawing for the power amp section for those interested. 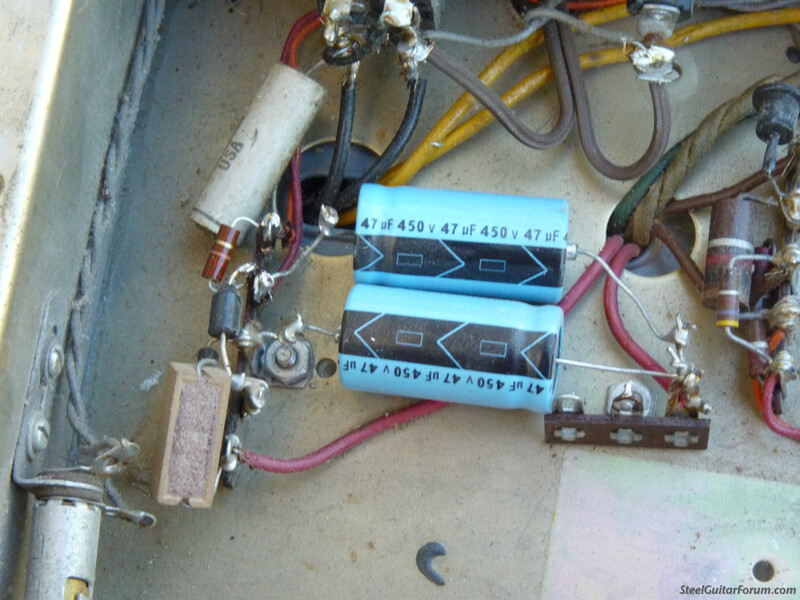 It can be seen that the Phase Inverter circuit is quite different than Fender and most other tube amps. Note: picture has been updated and shows the two feedback schemes. Thanks for this, Michael. That cascode PI had piqued my interest. Curious about the 6GW6 output stage. What plate voltage does it run at? I don't believe I've seen a voltage doubler used for a high power output section before. I see from data I could find on line that those bottles might not like too much screen voltage; is there a separate screen supply tap? What kind of output power are you expecting? I can't help but admire your diligence in this project, and will continue to watch as it progresses. P.S. Looked up the S100V power supply online. It is pretty unusual too. Definitely not Fender. Voltage questions answered. You made a remark about the screen voltages, which are only at about 150VDC while the plate voltages are up around 470VDC. 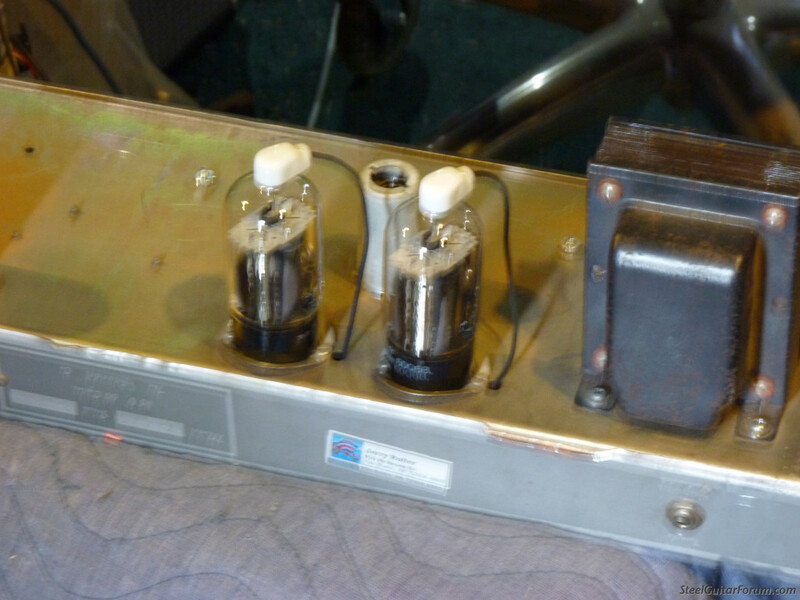 Later versions of the amp used 6GT5 tubes, which have similar specs to the 6GW6 tubes but without a plate cap and with a different tube base. Another unique thing about the Standels is that the Standby switch cuts off the screen voltage (which shuts the power tubes down), unlike the Fenders that shut off the high voltage to the whole amp.